Monsanto’s determination to link the growth of crops to the use of its herbicide is Orwellian. The traits most often “modified” in GM crops are those related to tolerance for herbicides, linking plant growth to its use. There is lots of money to be lost if glyphosate, the active ingredient, becomes widely considered a carcinogen and is eventually banned. 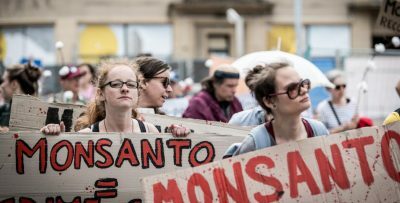 The European Union was seriously considering banning the chemical, but in November 2017 it bowed to concerns from member countries, Germany in particular, which is home to Monsanto’s parent company’s headquarters. Dewayne Johnson’s lawsuit was expedited because his cancer is terminal and it was believed that because of his health he might die before having his day in court. Johnson was diagnosed with non-Hodgkin’s lymphoma two and a half years into a job as the integrative pest manager for a California school district. A large part of his job was to spray these products in bulk 30 times a year. Johnson was not told that Roundup could cause cancer. On the job there were a few accidents with the sprayer used to spread the herbicide and Johnson was doused with the liquid at least twice. Monsanto maintains, even after this ruling, that Roundup is safe. Meanwhile, the top scientists with the World Health Organization in 2015 classified glyphosate as a probable human carcinogen. This court case is about much more than one man and his family. Roundup is one of the most popular herbicides in the world and its use is ubiquitous. Glyphosate, the key ingredient in Roundup, is the most widely sold herbicide in Canada and Roundup the most widely used weed killer in the world. So much so, that its residues are hard to avoid. U.S. scientists have even recorded traces of glyphosate in rainfall. In April of 2017, the Canadian Food Inspection Agency found residues of glyphosate in 30 per cent of the more than 3,200 food products it tested, including grains and common cereals. It found 1.3 per cent contained residues above the allowable limits. In early July, before this court ruling, the state of California moved to list glyphosate as cancer-causing, a first step toward requiring Monsanto to change its labelling. Like Dewayne Johnson, there are thousands more people suing or expected to sue Monsanto in the United States. The impact of this jury decision on Monsanto could eventually lead to billions more in damages. But this court case has also brought to light how Monsanto has tried to manipulate the results of scientific evidence in its favour to show that Roundup is safe for use. The San Francisco trial brought to light that Monsanto manipulated information and published ghostwritten documents as independent, credible, scientific reports. “The widespread cultivation of GM glyphosate-tolerant crops, in particular, has driven up the use of glyphosate-based herbicides. Glyphosate is the top pesticide ingredient sold in Canada, followed by 2,4-D and glufosinate ammonium. Glyphosate use in Canada tripled between 2005 and 2011, climbing from 30.2 million litres to 89.7 million in Western Canada, and from 3.8 million litres to 12.3 million in Eastern Canada. For now, Bayer’s Monsanto will likely do its best to fight for the survival of Roundup — given the many billions to be made on the sale of the herbicide and Roundup Ready seed, and the billions that could be lost in lawsuits. But even once it decides to cut its losses and move on, the use of herbicides linked to GM crops will still be a major issue. And like the tobacco industry, the chemical industry will have to be pursued publicly, long and hard, for all to see. Featured image is from Gustave Deghilage/Flickr.